Two fantastic match-3 classics together in one bundle! Two fantastic match-3 games together in one fun package! 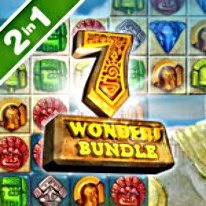 Included in this bundle is 7 Wonders of the Ancient World, in which you will embark on a journey from the Great Pyramid of Giza to ancient Greece and see if you can build the seven wonders of the Ancient World! It also includes 7 Wonders II which will take you on an epic ourney back in time to build the world’s most magnificent structures such as Stonehenge and the Taj Mahal. Watch each wonder come to life piece-by-piece in this fun and educational match-3 challenge!